Inorganic crystalline silicon solar cells account for more than 90% of the market despite a recent surge in research efforts to develop new architectures and materials such as organics and perovskites. In order to reduce the cost per watt and improve watt per gram utilization of future generations of solar cells, reducing the active absorber thickness is a key design requirement. This is where novel two-dimensional (2D) materials like graphene come into play because they could lead to thinner, lightweight and flexible solar cells. Experimental designs for several graphene-based solar cells have been reported so far, with graphene serving as different parts of the cell. Due to their excellent electron-transport properties and extremely high carrier mobility, not only graphene but also other direct bandgap monolayer materials such as transition-metal dichalcogenides (TMDCs) and black phosphorus show great potential to be used for low-cost, flexible, and highly efficient photovoltaic devices. 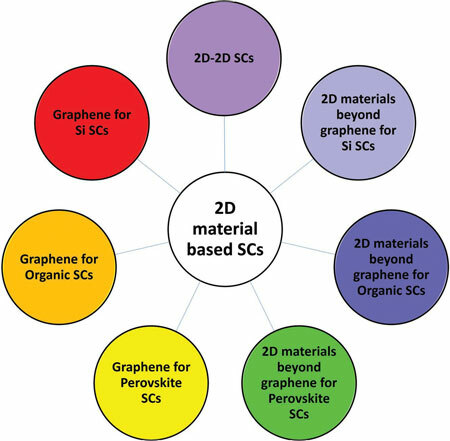 A recent review in Advanced Materials (« The Role of Graphene and Other 2D Materials in Solar Photovoltaics ») provides a comprehensive overview on the current state-of-the-art of 2D-materials-based solar photovoltaics. It describes the recent progress made with graphene, graphene-based materials, and other 2D materials for solar photovoltaics, including silicon-based solar cells, and organic and perovskite solar cells. In the first part of their review, the authors present the role of doped and undoped graphene as an ultrathin, transparent conducting electrode, and as a Schottky barrier junction layer (hole collector) for silicon-based solar cells. This section also discusses graphene (undoped/doped) as a charge-transport layer/transparent electrode for organic/perovskite solar cells. In a solar cell, the electric field formed due to the potential energy barrier between two dissimilar materials at the interface is capable of separating the electrons and holes generated by absorption of light within the materials. Based on the type of materials at the interface, there are three types of junctions, which are homojunction, heterojunction (formed between two different semiconductors having different energy bandgaps), and Schottky junction (a metal–semiconductor junction where band bending occurs). While graphene allows better transmission of light into the semiconductor, it also forms a Schottky barrier junction with silicon for effective separation of the electron–hole pairs and collection of the charge carriers. The authors discuss in detail the role of graphene as transparent conducting electrodes and as junction layers (hole collectors) in graphene–Si solar cells. ITO, which has a key role as a transparent conductive electrode for organic-based and perovskite-based solar cells, suffers from some disadvantages. In these organic solar cells, graphene – due to its high conductivity, desired work function, and optimum surface morphology – can act as a potential substitute for ITO, while offering similar performance with respect to transparency, conductivity, flexibility, with higher material availability and lower processing costs. The review in great detail covers the role of graphene-based materials for electrodes, charge-transport layers, and tenary materials for organic solar cells as well as charge-transport layers and stabilizing material for perovskite solar cells. Theoretically, a single TMDC monolayer with sub-nanometer thickness has the capability to absorb as much sunlight as 50 nm of Si or 15 nm gallium arsenide (GaAs) and, therefore, can generate electric currents as high as 4.5 mA cm-2. The authors discuss and calculate the potential performance of TDMCs for silicon-based solar cells, organic solar cells, and perovskite solar cells. In the final section of the review, next-generation concepts such as tandem and hot-carrier solar cells based on 2D materials, and on-chip integrated design of energy harvesting and storage devices are discussed, leading to an ideal solar cell where the entire energy of any absorbed photon is harvested.